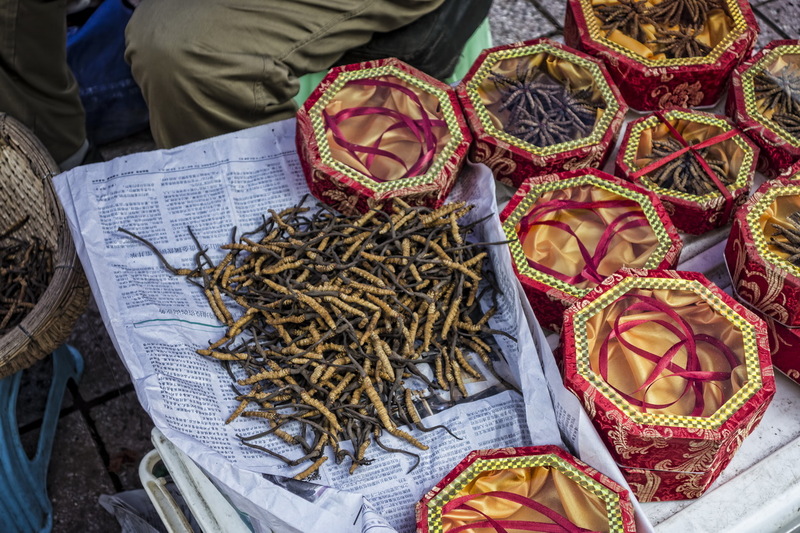 Winter Insect Summer Herb… In May 2015 I traveled with my good Chinese friend Jun Quan from Chengdu, the capital city of Sichuan, up to the north-west of the province to Sertar in the Daxue mountains and the incredible Larung Gar Buddhist Institute – the largest Tibetan Buddhist institute in the world. It’s a two day journey by car and a total of nearly 650kms, which in May 2015 when we did it, consisted of about 400kms of good roads from Chengdu to Ma’erkang, the capital city of Aba Prefecture, then a horrendous 250kms of terrible road to Sertar because of extensive road works! Ma’erkang is a pleasant and seemingly quite prosperous city. It has quite good hotels and a touristy walking area downtown with all sorts of local shops and restaurants. The main thing for sale though with the street vendors was something called “dong chong xia cao“. Which translates as “winter insect summer herb” and turns out to be somewhat of a local specialty. Which is gathered in the surrounding hills and mountains and then packaged for sale. 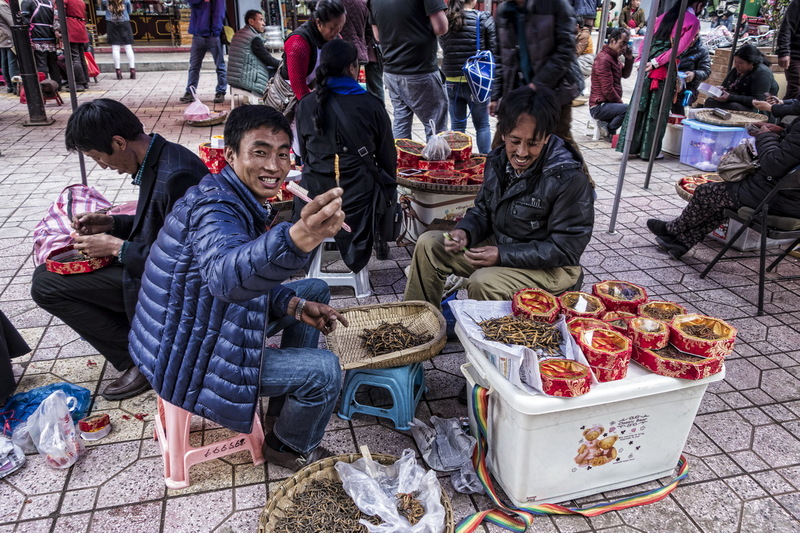 There was lots of the stuff available and Jun assured me that it was very popular in China… I remained unconvinced and declined the many offers from the vendors. A bit of Googling now that I am home reveals that dong chong xia cao is actually a Cordyceps. Or parasitic fungus, which starts to explain where the interesting name comes from! 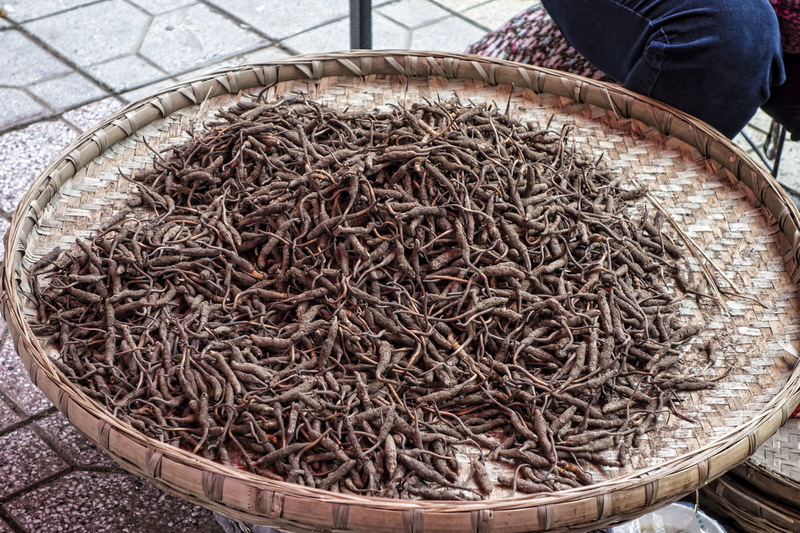 The type of Cordyceps that creates dong chong xia cao is Cordyceps sinensis. Which grows from specific caterpillars in the mountainous regions of southwest China. And its modus operandi is to infect the larva of hibernating moths in late autumn. As autumn turns in to winter the fungus proliferates, eventually killing the caterpillar and causing the outer shell to harden. In spring a stroma develops and emerges from the larva, growing to be much longer than the original body. Which is when the fungus and the body are harvested.